Clazziquai is a acid jazz,house, electronica, easy listening band that have fresh beats from DJ Clazi along with smooth vocals from male lead Alex Chu and female lead Horan Choi. “Be My Love” and “She Is“, were featured in the Korean hit television drama, My Lovely Samsoon. 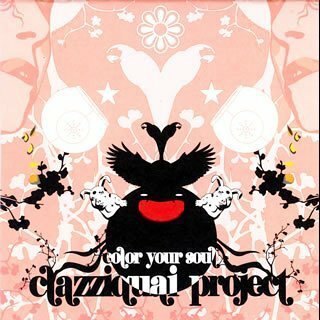 Clazziquai’s second album, Color Your Soul, charted #3 in the Kyobo Hot track list, as well as #5 in the Hanter Album chart list.Released September 22,2005. The album starts off with the short intro Beautiful Woman with sound bytes of an actor talking about a woman. What an interesting way to start off an album. Salesman is a track lead by Christiana with ‘oh yea’ from Alex placed throughout the song. It’s refreshing to listen to a Korean band that sings in English that actually makes sense and is relaxing . ‘My heart is frozen like ice’ and ‘My heart is beating like a drum’ are great simile’s. Christiana’s voice is so innocent sounding. Fill This Night starts off with a funky ‘70’s beat and Alex leading with Horan echoing the chorus. ‘Let’s get dance now’ and ‘Fill this night with me’ add some fun to the song. Alex’s smooth adlib’s towards the end sound amazing. Cry Out Loud starts with a cool techno beat with Horan singing. The song sounds really futuristic and cool, but there isn’t that wow factor that I got from Salesman and Fill This Night. Aw! A brother/sister duet with Christina and Alex. I Will Give You Everything has a casual, day-at-the-beach sound. It’s borderline R&B, something different from the group and I love this song. Come Alive is reminiscent of Futuristic from Instant Pig, the albums first album.When I first heard this song, I could’ve sworn it was Horan singing! No, Alex’s sister Christina is singing this. The song has a groovy ‘I Will Survive’ disco feel. Dateline is nice lighthearted duet with Alex and Horan. I am in love with the flute in this song and the guitar solo! It’s just gorgeous ( I love me some flute). Be My Love English Version House Remix was one of the songs featured on the soundtrack for Korean drama My Lovely Sam-soon along with She Is. Christina says a few words of babble that I didn’t understand then Alex and Lee Sung Yul pretty much carried the rest of the track. Finally, we get more Horan in Dance. What a voice! Horan’s husky vocals combine with Alex’s smooth crooning in the background over a wonderful rhythm. This is one of my favorite. Everything about Color Your Soul is love. The guitar in the intro paired with Alex’s velvet voice and complimented with Horan’s sweet voice. Christina finishes the album with Speechless, a smooth track over a guitar and sounds of nature. The song is soothing and peaceful. The simpleness of the lyrics is refreshing. Clazziquai bring a more polished version of Instant Pig to the table and it was a good album. I rate this 4.5/5!